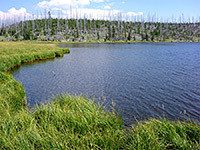 There are several small, scenic lakes close to the Grand Loop Road between Norris and Canyon, all reached by trails; Ice, Wolf, Grebe and Cascade, of which the latter is most popular and may be accessed by two routes both about 2 miles in length. One (Cascade Creek Trail) follows a small stream northwards, where it joins the alternative path (Cascade Lake Trail) from where the lake is a little way further, beyond a flower-filled meadow. Here a rather more strenuous and much less used path, the Observation Peak Trail, climbs 1,400 feet over 3 miles to an isolated summit in the Washburn Range, which gives a fine, 360° panorama over a large area of the northern section of the national park. The slopes are mostly free of trees so the views are good all the way, and the open hillsides bear a wide variety of wildflowers in summer. 14 views along the Cascade Lake and Observation Peak trails. The Cascade Lake Trail, slightly shorter of the two routes to the lake, starts at a large parking area one mile north of Canyon junction. The path enters airy pine woodland, soon passes the junction with a spur from a picnic area a little way further north along the highway, then turns west, out of the forest and into bushy grassland. A trailhead sign and map are located on the far side of a bridge over a little creek; from here the trail continues west and for the next mile runs close to the edge of a meadow, over two more streams and several smaller, usually dry watercourses. Flat grassland stretches to the south, forested hills rise to the north. The surroundings become more overgrown as a large stream (Cascade Creek) approaches, and the alternative route (Cascade Creek Trail) joins from the left. 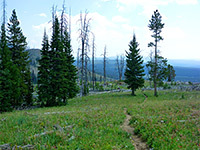 More sparse woodland is followed by a larger meadow, crossed by other tiny brooks lined by flowers and longer grass, and with Cascade Lake visible beyond. The lake itself is quite scenic but not especially so, surrounded by grassy banks and uniform low hills, nothing very distinctive. The Observation Peak Trail forks off at a junction on the north side of Cascade Lake and right away begins a steady climb, initially through clumps of woodland then up mostly open hillsides, exposed and hot on sunny summer's days. These lower slopes are crossed by a few creeks and marshy areas but the upper parts are dry. 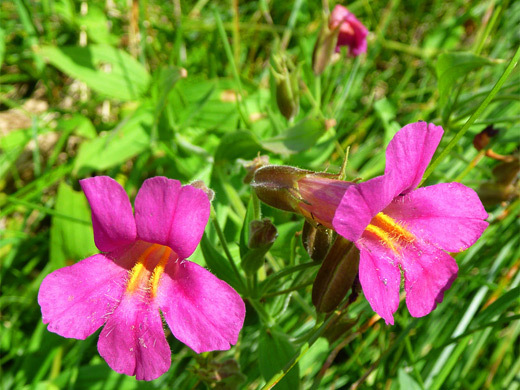 The moister locations harbor showy wildflowers such as the bright pink Lewis monkeyflower and purple fringed gentian. The path climbs to one such area, becomes temporarily less steep then rises some more to a saddle, where Observation Peak first comes properly into view. 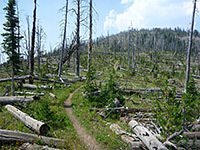 Another short ascent takes the trail to a ridge, through a patch of taller trees and on to an area of burnt woodland, the trees mostly dead, about half still standing and half downed. There are many flowers here too, especially lupine. The route follows the ridgeline that leads to the peak, veering left after a long straight section, through some switchbacks then round the front of the mountain into a flat, sheltered, wooded basin, and up the final incline to the summit. The peak has open views all around, especially to the south, west and north; here features include the deep valley of Tower Creek and a larger gorge (Arrow Canyon) a little way west. A wooden lookout tower sits right on the summit, which is formed of grey, lichen-covered boulders, with a few patches of stark dead trees just below. Other locations in view include Cascade and Grebe lakes below to the south, Grand Canyon of the Yellowstone off to the east, and higher summits of the Gallatin Range in the distance to the west. The landscape is apt to be hazy, and much of the surroundings are rather similar in all directions - greyish green, undulating, densely wooded hills - but the peak, and hike, are enjoyable and well worth the 3 to 5 hour round trip.